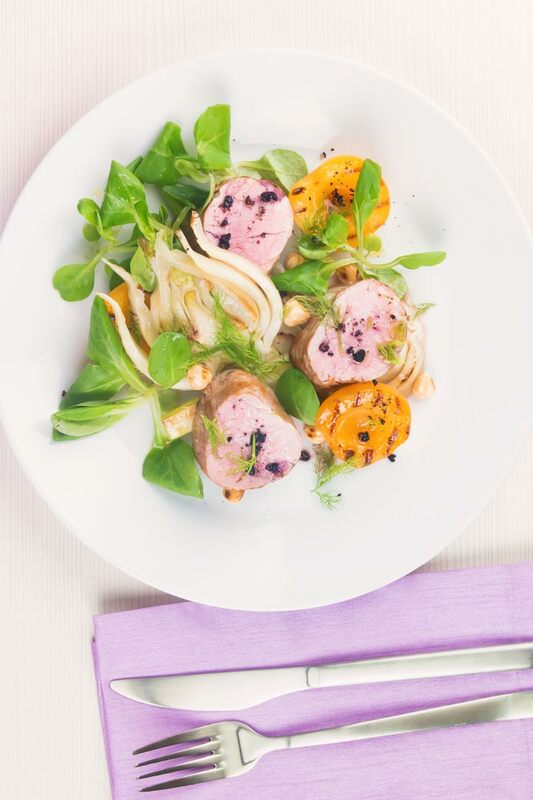 Roast pork tenderloin is the perfect ‘quick cook’ piece of meat, beautifully tender when cooked pink and served here with gin braised fennel and seared apricots. Another of my meals designed to impress, delivering on both flavour and style but ready in just over 30 minutes! 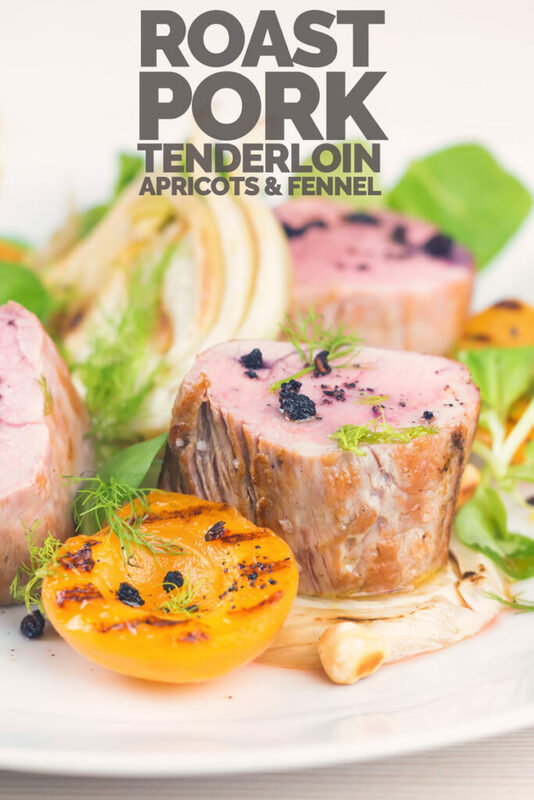 Roast Pork Tenderloin with Apricots and Fennel. 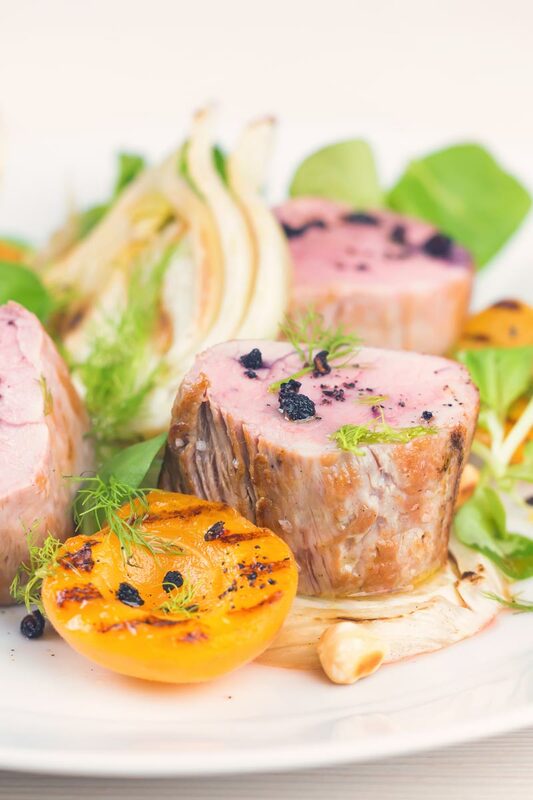 Pork has a great affinity with both fruit and fennel and this dish takes full advantage of that. Pork with fruit is something I do all of the time, the natural association is with apple as in these apple and mustard sausage rolls. But don’t hold yourself to just that, so many fruits work well with pork, here I have a blackberry sauce with pork chops. 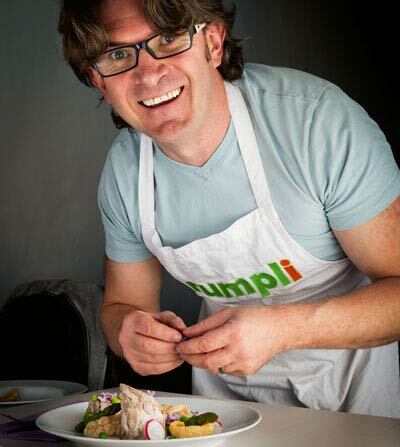 Got cherries, well, in that case, check out his beautiful pressed pork belly with cherries, it is another real head turner! The light aniseed flavour of the fennel here marries beautifully with sharp and sweet apricots. Then we have gin, not the first alcoholic ingredient that many think of cooking with. I have no idea why as that juniper flavour is wonderful particularly with fennel. It also ties up with the unique and remarkable flavour of Tasmanian pepper. Anyway, the lass behind the stall overheard myself and Julie pointing out the different peppers. Naturally, like all good salespeople, she immediately siezed on that handing me peppercorn after peppercorn to munch on. Now pepper is an acquired taste and one I love, easy to overpower a dish but get it right and it is magical. It is the core flavour and heat component of both my Mulligatawny soup and Chettinad Chicken recipes. Anyway, I was handed a little Tasmanian peppercorn and took a bite… Well, I was in heaven! It starts off with a really floral flavour, almost like Szechuan pepper. It then went insanely hot, a real punch of unmistakeable pepper heat. But it got better the complex flavour returned after the heat and fizzed around my mouth for ages afterwards. But I am good I hate being sold to, I walked away. It lasted around half a beer before heading back to buy some! 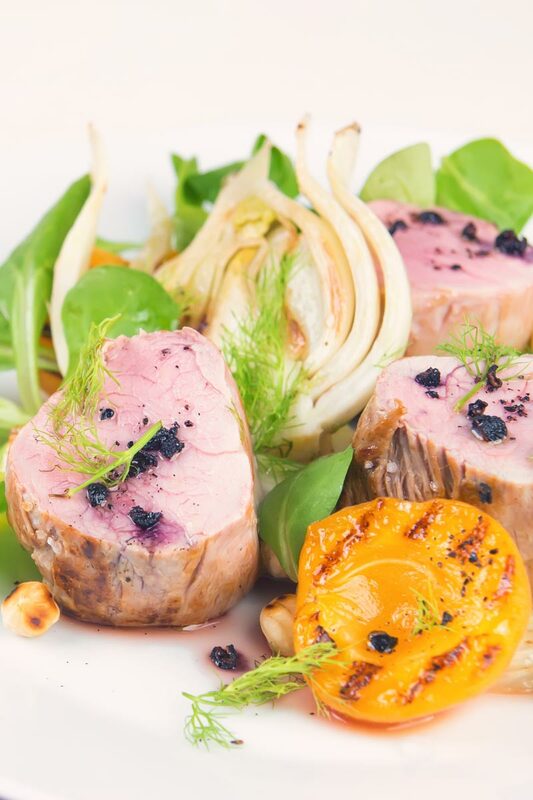 This roast pork tenderloin recipe was developed with showing off Tasmanian pepper. It ties everything together and adds a floral heat, go figure, and complexity to the dish. If you can’t get Tasmanian pepper use a 50 50 split of black pepper and Szechuan pepper. What’s The Difference Between Pork Tenderloin and Pork Loin? In short, there is a world of difference between the two! Yet for some reason I often see the two confused with each other online. Essentially the difference is the same as the difference between a Sirloin Steak and a Fillet Steak. They are indeed from the same anatomy of a pig as the aforementioned are on a cow. Just like the beef equivalents, they require slightly different treatments. The pork loin requires slightly longer and lower temperature cooking or even long slow roasting. Pork tenderloin, on the other hand, is all about quick cooking. It really benefits from being cooked so that it remains pink, still controversial for pork. Probably because we are very slow to update out cooking thinking, pink pork is perfectly safe. Much like my bacon wrapped pork tenderloin, this roast pork tenderloin recipe cooks in just 12-15 minutes. It is then rested to leave the most wonderfully tender and juicy piece of meat. Forget dry pork, this stuff is almost butter like and tastes beautiful! Roast pork tenderloin is the perfect 'quick cook' piece of meat, beautifully tender when cooked pink and served here with gin braised fennel and seared apricots. Then slice your fennel into 5mm slices. Heat a dry pan over a medium high heat and toast your hazelnuts. When your hazelnuts are toasted remove from the pan and add your black pepper and toast. Remove the pepper from the pan and gently crush. Heat a large pan over a high heat and when hot add half of the olive oil. Season your pork tenderloin generously with salt and then sear in the pan on all sides. When seared transfer to the oven and roast for 12 minutes at 180°C, 350°F. In the same pan that you seared the pork add another teaspoon of the oil and then throw in the fennel and sear for a minute on each side. Pour in the gin, reduce the heat to low, season with salt and add a lid and cook for 5 minutes. After 12 minutes remove your pork and allow to rest for 3-4 minutes. Heat a griddle pan and sear your apricots. When you remove the fennel from the pan for plating add in the remaining olive oil to create a warm dressing for the meal. Carve your pork and then plate sprinkling the Tasmanian pepper over the pork and apricots. Could I make this with dried apricots and simply add them to the fennel and gin while simmering? The few times I’ve tried to grill stone fruits it’s been a disaster. Of course you can, I’d love to hear how that comes together. I suspect that your not working hot enough if you are struggling grilling fruit, you also need to let it sit. If you try and move before the sugar have caramelised you will just tear the cut face off the fruit. Pork and fruit really do go so well together. I love how you have used summery apricots, would be quite scrumptious. As an Aussie, I am interested in the Tasmanian pepper you picked up. Wondering if that is our native pepper berry. It if is, it is amazing! Hey Sara… Apparently Tasmanian pepper is AKA Tasmanian Pepperberry or Mountain pepper, not sure if that helps 😉 But it is truly amazing! I love the sound of that tasmanian pepper. I am totally going to try and hunt it down. Great recipe! the pork sounds delicious. 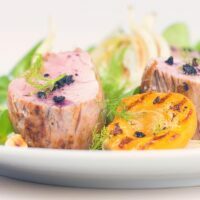 What delicious flavours – I do love a roast pork tenderloin so going to have to give this recipe a try! What a delicious recipe! I love the pairing of pork with apricots. Can’t wait to cook this one up!